Mawra’s Birthday has somewhat been very popular these past two days due to celebration at the sets of her upcoming drama serial “Aangan” and due to her spending her big day at an old age home. She spending her birthday at an old age home is a very beautiful gesture of kindness on her part and the fans crave to see such humble and kind side of their favorite personalities. Mawra has done yet another thoughtful gesture on the occasion of her birthday. She decided to donate for Dam fund so as to give back to the nation that has made her who she is today. 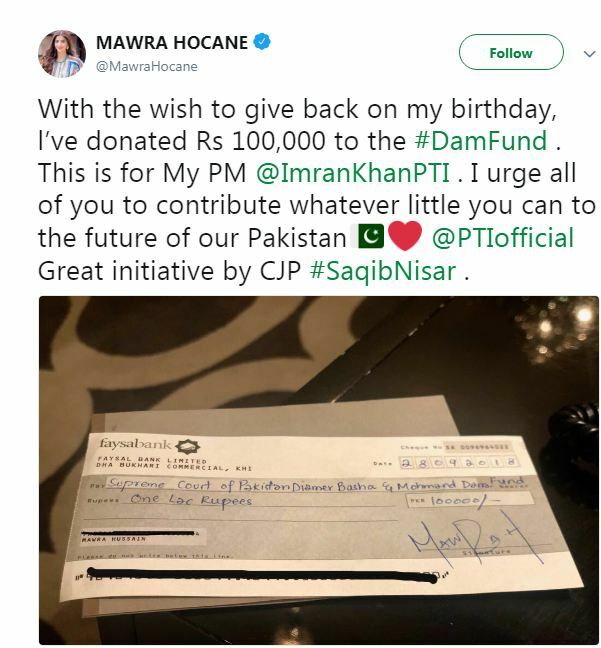 Mawra tweeted, “With the wish to give back on my birthday, I’ve donated 100,000 to the Dam Fund”. She said that this was for the Prime Minister Imran Khan. “This is for my PM @ImranKhanPTI”. Mawra has also urged everyone to participate in the fund so as to serve a bigger cause. “I urge all of you to please contribute whatever little you can to the future of our Pakistan”. She further admired Chief Justice of Pakistan Saqib Nisar for this great initiative.